The entrepreneurial business approach, together with the simplification of complex bureaucratic procedures and the willpower to tackle problems without hesitation, lie at the very heart of LINK group’s business model. Under the leadership of president and founder Dr. Valentin Kuleto, the company has become a leader in modern education, e-learning education and internet business in less than two decades. Dr. Valentin Kuleto has successfully headed and brought to fruition a large number of education projects. His work, vision and energy constantly redefine, develop and enhance education in a manner which corresponds with contemporary society and the needs of its citizens. Ever since the foundation of the company, Valentin Kuleto has been dedicated to innovation and development. This is why LINK group’s employees are constantly focused on enhancing current services and creating new ones, with the aim of improving and elevating the company’s business activities. There is only one law in the modern age: If you don't progress, you regress. One cannot afford to conform to the status quo, or be satisfied with what one has achieved in education and business, the key areas of modern life. This is why LINK group provides selfless support for new products and creative ideas. Anyone with a good idea or product can expect our support for the realization of their projects, be they clients, students, employees, or others. Instead of bureaucratic apathy, LINK fosters boldness in experimenting with novelty. LINK group’s main activities, education and business, are key to any society. It is, therefore, the mission of each employee to contribute to social development, values and progress. By developing experts, connecting companies with employees, various educational and humanitarian projects, the company is dedicated to creating a legacy aimed at altering the future for the better. “Change requires vision, and the ability to plan and act. Change doesn’t begin in the office, at meetings, or in folders. Change begins in our minds”. A company's value is in its people. Their energy, knowledge and dedication are the key to success. This is why LINK group aims to help people become successful through a developed training network, and numerous support services enabling clients, partners and employees to achieve incredible results. “Let's bring talented people out of the shadows”. The reason why we are so good at solving problems is our rule that meetings are attended by those who can help the most, regardless of their position in the hierarchy. Our principle “knowledge over title” is one of the indicators of LINK group’s success. 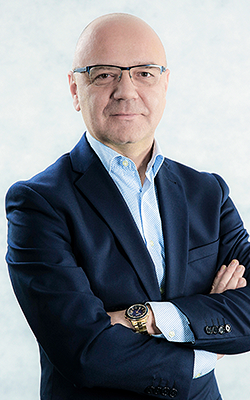 Dr. Valentin Kuleto earned his bachelor’s degree in mechanical engineering from the Faculty of Mechanical Engineering in Belgrade, followed by a master’s degree in management in education, i.e. the theoretical basis for the implementation of the distance learning software platform. In addition, Dr. Kuleto obtained a PhD for his research on the adaptive personalized distance learning model. With over two decades of active participation in various types and levels of education and modern business, Dr. Kuleto gained immense experience which enables him to make judgements and decisions that lead the company and society in the right direction. Excellent education, life and business experience, resolution and openness to new ideas are the core values Dr. Kuleto strives to convey to his associates in order to contribute to positive change in our world. You can read more about Dr. Valentin Kuleto’s career on his blog. Kuleto V., Stefanović M., Radić G., Pokorni S., Distance learning at the Belgrade Academy of Computer Sciences (Obrazovanje na daljinu u Beogradskoj akademiji računarskih nauka). In: The 10th International Conference on Quality Management and Reliability ICDQM. Belgrade, June 13-14 2007, pp. 813-818. Kuleto V., Stefanović M., Radić G., Pokorni S., Testing and Learning Software (Softver za izradu testova za proveru znanja i učenje). In: The 10th International Conference on Quality Management and Reliability ICDQM. Belgrade, June 13-14, 2007, pp. 819-824. Kuleto V., Radić G., Pokorni S., Kostić A., THE SOFTWARE PLATFORM FOR DISTANCE LEARNING (Softverska platforma za učenje na daljinu). In: INFOTEH - ICT Conference and Exhibition, Jahorina, March 26-28, 2008. Kuleto V., Radić G., Pokorni S., Kostić A., THE SOFTWARE PACKAGE FOR LEARNING AND DESIGNING LEARNING ASSESSMENTS (Softverski paket za izradu testova za proveru znanja i učenje). In: INFOTEH - ICT Conference and Exhibition, Jahorina, March 26-28, 2008. Kuleto V., Radić G., Pokorni S., Kostić A., THE INFORMATION SYSTEM OF THE INFORMATION TECHNOLOGY SCHOOL (Informacioni sistem Visoke škole strukovnih studija za informacione tehnologije). In: The 11th International Conference on Quality Management and Reliability ICDQM. Belgrade, June 18-19, 2008, pp. 816-820. Kuleto V., Maričić G., Radić G., Pokorni S., THE INFORMATION SYSTEM OF A HIGHER EDUCATION INSTITUTION (Informacioni sistem visokoobrazovne institucije). In: INFOTEH - ICT Conference and Exhibition. Jahorina, March 18-20, 2009, E-II-1: pp. 466-470. Kuleto V., Stokić M., Bajalica J., Pokorni S., WEB PRESENTATION MANAGEMENT SYSTEM (Sistem za upravljanje sadržajem Web prezentacije). In: The 12th International Conference on Quality Management and Reliability ICDQM. Belgrade, June 25-26, 2009, pp. 750-756. Valentin Kuleto, Slavko Pokorni, Jovanka Bajalica, DISTANCE LEARNING SYSTEM, E-Learning in academia in the Balkans, Instructions: barriers, challenges and opportunities, pp. 10–17, Vranje, Niška Banja, September 25–27, 2009. Valentin Kuleto, Aleksandra Bradić-Martinović, Zvonko Brnjas, DISTANCE LEARNING – IN THE CASE OF SERBIA, Strengthening the educational and scientific collaboration between faculties of economics within V4 and countries of Southeastern Europe (No. 30810004 - IVF), Karvina, International Visegrad Fund, October 22–23, 2009. Valentin Kuleto, Velimir Dedić, Slavko Pokorni, Nikola Subotić, The characteristics of professional development students in the distance learning programme (Karakteristike polaznika profesionalnog obrazovanja u režimu učenja na daljinu). In: INFOTEH - ICT Conference and Exhibition, Jahorina, 17-19. March 2010. E-IV-4, pp. 636–639, Vol.9. Valentin Kuleto, Velimir Dedić, Slavko Pokorni, ISSUES REGARDING THE TAXONOMY OF LEARNING OBJECTS AND THE STANDARDIZATION OF e-LEARNING (NEKA PITANJA TAKSONOMIJE OBJEKATA UČENJA I STANDARDIZACIJE E-UČENJA). In: The 13th International Conference on Quality Management and Reliability ICDQM. Belgrade, June 29-30, 2010, pp. 518-524. Valentin Kuleto, Velimir Dedić, Slavko Pokorni, Jovanka Bajalica, THE SOFTWARE PLATFORM FOR DISTANCE LEARNING (Softverska platforma za obrazovanje na daljinu). In: E-Learning Towards a Knowledgeable Society (Konferencija Elektronsko učenje na putu ka društvu znanja). Belgrade, October 7, 2010, Belgrade, pp. 23-28. Valentin Kuleto, Velimir Dedić, Slavko Pokorni, Jovanka Bajalica, USING LEARNING AND LEARNING ASSESSMENT SOFTWARE AS A LEARNING AID (SOFTVER ZA IZRADU TESTOVA ZA PROVERU ZNANJA I UČENJE KAO PODRŠKA E-UČENJU). In: E-Learning towards a knowledgeable society (Konferencija Elektronsko učenje na putu ka društvu znanja), METROPOLITAN University. Belgrade, October 7, 2010, pp. 174-179. Valentin Kuleto, Slavko Pokorni, Velimir Dedić, AN IMPLEMENTATION OF THE DISTANCE LEARNING SOFTWARE, INFOM, Faculty of Organizational Sciences, pp. 37–42, Belgrade, July 2011. Valentin Kuleto, Slavko Pokorni, Velimir Dedić, Suzana Marković, ANALYSIS OF FACTORS INFLUENCING PERCEIVED QUALITY OF E-LEARNING, Proceedings of The Second International Conference on e-Learning, eLearning-2011, Metropolitan University, pp. 12–17, Belgrade, September 2011. Valentin Kuleto, Slavko Pokorni, THE QUALITY OF EDUCATION AT INFORMATION TECHNOLOGY SCHOOL, The 15th International Conference on Quality Management and Reliability ICDQM, Plenary paper, Belgrade, June 28–29, 2012. Dedić Velimir, Marković Suzana, Kuleto Valentin, Learning Styles and Graphical User Interface: Is There Any Preference? NEW EDUCATIONAL REVIEW, (2012), vol. 28 no. 2, pp. 73–83. Kuleto V., Miranović B., Pokorni S., ENSURING THE QUALITY OF WEB-BASED E-LEARNING MATERIALS AT LINK GROUP AND ITS, 4th International Conference Life Cycle Engineering and Management ICDQM 2013, Belgrade, Serbia, June 27–28, 2013, pp. 40–50, ISBN 978-86-86355-14-0, COBISS.SR-ID 199083788 (plenary lecture). Valentin Kuleto, Svetlana Anđelić, INTERACTIVE TEACHING METHODS AS A FACTOR OF CONTEMPORARY EDUCATION AT ITS (INTERAKTIVNE NASTAVNE METODE KAO FAKTOR SAVREMENOG OBRAZOVANJA NA ITS), Reengineering of business processes in education, National Conference, University of Kragujevac, Faculty of Technical Sciences, Čačak, September 20–22, 2013. Kuleto V., Pokorni S., Miranović B., IMPORTANCE OF SELF-EVALUATION FOR QUALITY ASSURANCE IN THE E-LEARNING PROCESS, The Fourth International Conference on e-Learning-2013, 4th Conference on e-Learning – 2013, Proceedings, Belgrade Metropolitan University, September 26–27, 2013, pp. 46–53. Valentin Kuleto, Svetlana Anđelić, WEB APP FOR CAT TESTING OF STUDENTS (WEB APLIKACIJA ZA CAT TESTIRANJE STUDENATA), TELFOR, Belgrade, November 26–28, 2013, published at IEEE Xplore Digital Library: https://goo.gl/CwkwX0. Valentin Kuleto, Velimir Dedić, Math e-Learning Based on the Principles of Transactional Analysis (E-učenje matematike na principima transakcione analize), SINTEZA 2014. Proceedings, Belgrade, Singidunum University, April 25 and 26, 2014. Valentin Kuleto, Slavko Pokorni, Goran Radić, DETERMINING ESPB FOR THE ACADEMIC PROGRAM (ODREĐIVANJE ESPB ZA PREDMETE STUDIJSKOG PROGRAMA), ICDQM-2014, 17th International Conference on Quality Management and Reliability, 5th International Conference Life Cycle Engineering and Management, Proceedings, Belgrade, June 27–28, 2014, ISBN 978-86-85355-16-4, COBISS.SR-ID 207635724. Pokorni S., Kuleto V., Anđelić S., Radić G., Kostić A., Simović V., Research on the compliance of ESPB and student workload (Istraživanje usaglašenosti ESPB i opterećenja studenata), 18th International Conference on Dependability and Quality Management, ICDQM 2015, Prijevor, Serbia, June 25–26, 2015, pp. 71–76, ISBN 978-86-86355-18-8, COBISS SR-ID 215642124. Svetlana Anđelić, Bojan Ristić, Valentin Kuleto, Goran Radić, Education of specialists based on the competences required on the labor market (Obrazovanje stručnih kadrova zasnovano na kompetencijama potrebnih tržištu rada), 3rd Conference “Reengineering of business processes in education 2015”, Faculty of Technical Sciences, Čačak, University of Kragujevac, September 26–27, 2015.
International Journal of Engineering Research & Technology (IJERT) (ISSN: 2278-0181) www.ijert.org, Title: Modernizing the Public Administration – the Path to Digital Society Paper ID : IJERTV5IS020011, 02, February – 2016.